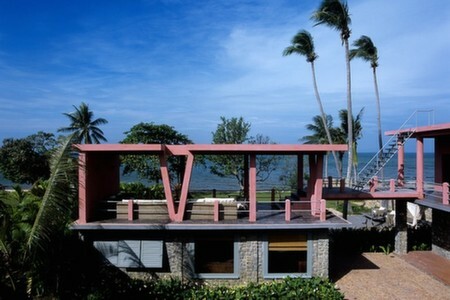 Three beautifully converted modernist villas from Cambodia's 1960s heyday located on the southern shores with wonderful ocean views. 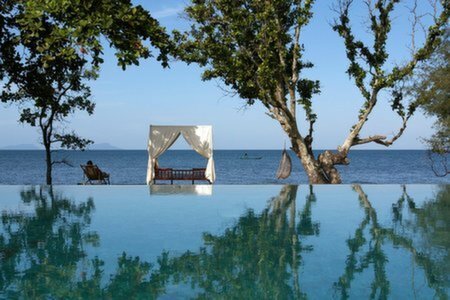 Knai Bang Chatt is a true gem of a find on Cambodia's southern coast. These lovingly converted modernist villas, built by a contemporary French architect, ooze style, luxury and have bags of character. There is nowhere else quite like it in the country. With a big infinity pool, an abundance of yoga, sailing and water sports activities on offer, it makes for the perfect ocean retreat. There is not a real beach here, but with so much else on offer and wonderful ocean views, many may not mind that. Its lack of 'perfect beach' is almost its charm, and perhaps the reason it feels so undiscovered. Sitting in a wicker-basket seat that hangs from a tree on the raised sandy area that looks out to the ocean is one of the finest sunset spots in south-east Asia. The elegant minimalist rooms are light and airy and softened by warm tones, weathered wood and ceramic wares. The polished concrete floors help keep the rooms cool in the summer and add to a funky finishing touch to the decor. 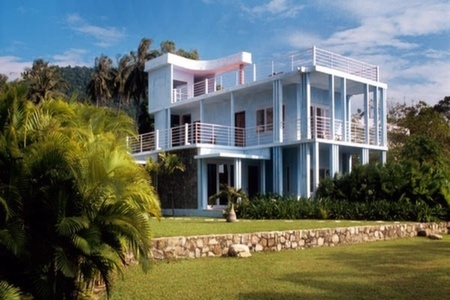 The rooms are spread over the three traditional villas as well as some small never villas built in the same style. None of the rooms, except the suite, have a TV. 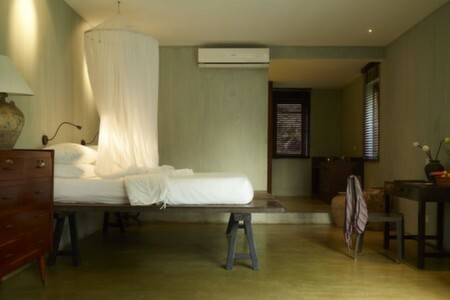 All rooms have sturdy teak beds, antique desks and chairs as well as a terrace with outdoor seating area (some are shared with the room next door). We love all the finishing touches here, like the lamps on huge ceramic vase bases that sit on wooden barrels in some rooms, and the bamboo ladders that serve as towel racks in the handsome en-suites. 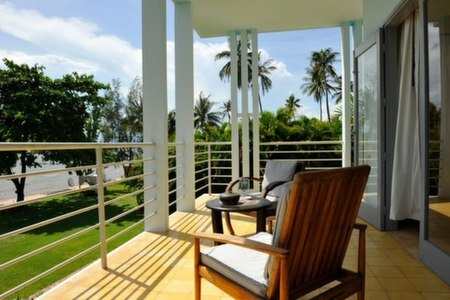 There is a Single Room for solo travellers, which has a private balcony. And families with older children may like to request a Sea View Double Room and a Twin Room, which are next to each other with a shared balcony. 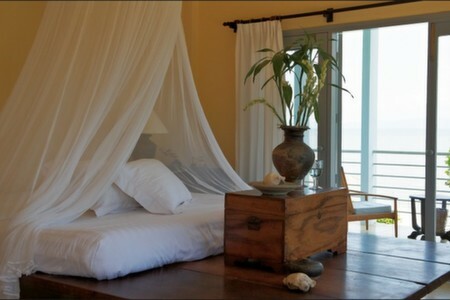 The Deluxe Sea View Rooms are fabulous - we particularly love rooms 4 and 16 in this category. 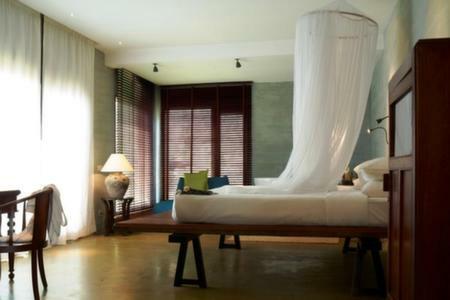 However, the most impressive room at the resort without a doubt is the beautiful open-plan Knai Bang Chatt Suite, which spans the entire second floor of the newest villa. 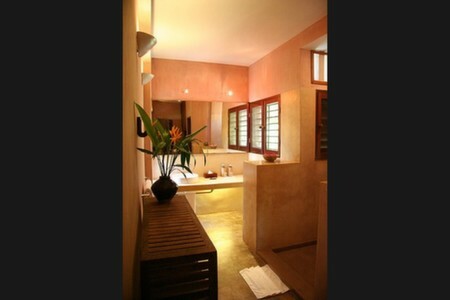 It has a large sleeping area in the centre surrounded by a seating area and a large Jacuzzi tub. 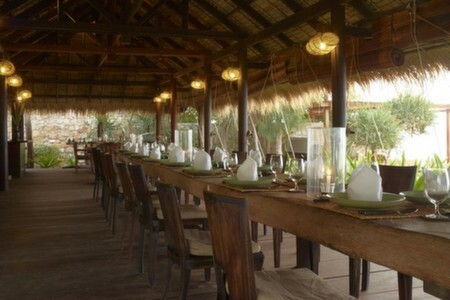 The resort has a restaurant that serves a simple breakfast buffet and for lunch and dinner offers an excellent Khmer-French fusion. You can enjoy these meals whenever you want, anywhere around the complex so can also enjoy them from your private terrace. Private dining can be arranged on the roof top or at the end of the jetty. The resort is in a fairly isolated spot, so there are not many other restaurants nearby. There are six or seven local shack-style restaurants nearby which serve fresh crab and other delights from the sea and there is a seafood restaurant at the resort next-door too. The resort also has a sailing school with catamarans surfboards and waterskis for hire and the hotel can arrange boat trips and other excursions. But with its unbelievably relaxing charm and atmosphere, most would be happy just whiling away their time lying by the pool and ocean. “Lovely and relaxing hotel. The food at The Strand was excellent. We also enjoyed a nice meal at the Sailing Club. The water sports were great - sailing, kayaking and paddleboarding. Perfect ending to our holiday.” - Tracy H, Nov 2015.